There are still plenty of the multi-colored carrots left in the refrigerator. It has been a while since I tried making carrot cake with cream cheese frosting. It is time to indulge! 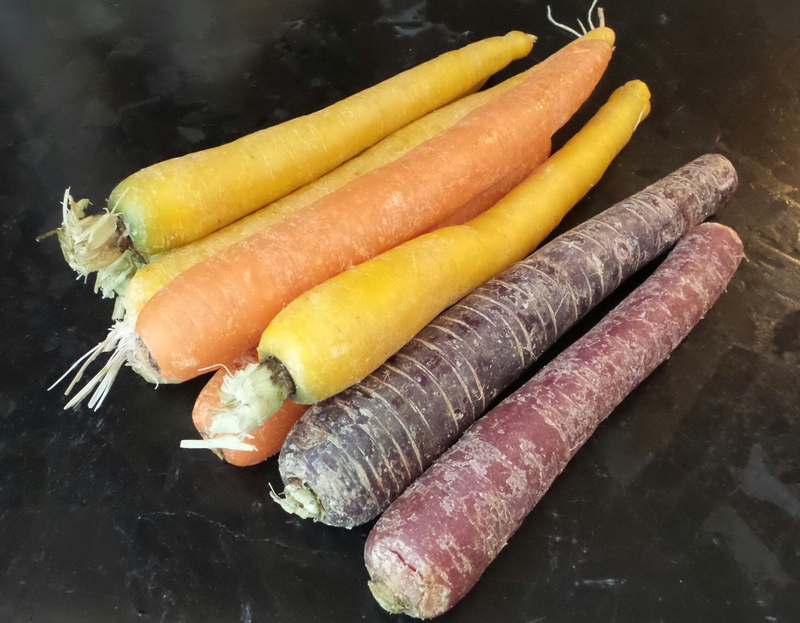 1/4 cup grated multi-color carrots. Grease two 10-inch cake pan and line with parchment paper at the bottom. Sift flour, baking powder, baking soda, cinnamon, and salt into a bowl. Set aside. In the large mixing bowl, beat egg, oil, sugar, and vanilla extract until thick and creamy. Stir in the flour mixture. Fold in grated carrots. Bake in the pre-heated oven for 40 minutes or until a toothpick inserted in the center of the cake comes out clean. Cool in cake pan for 10 minutes. Then invert cake pans onto a wire rack and remove the pans. Cool cakes completely on wire rack. Sift confectioner sugar into a bowl. In a mixing bowl fitted with the paddle attachment, whip softened butter, cream cheese, 1 tsp vanilla extract until well blended. Add sugar, and beat until mixture is soft and creamy. Divide cream cheese frosting in half. Mix half the cream cheese frosting with 1/2 cup chopped pecans. 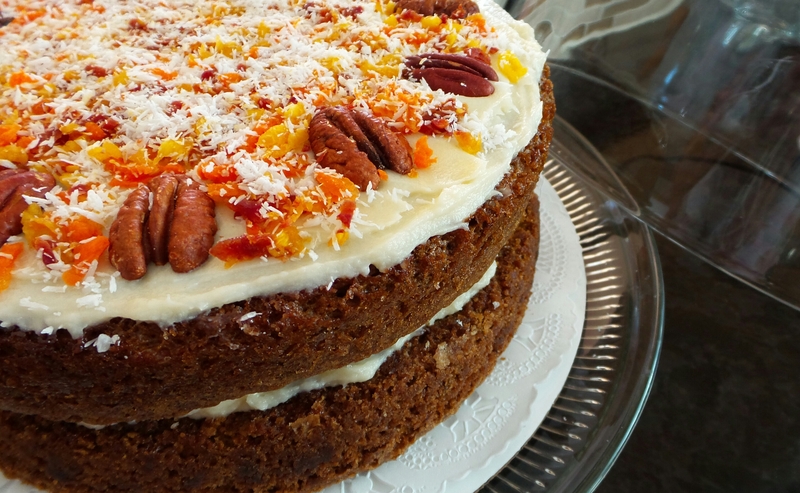 Place one layer of the carrot cake on a serving plate. Spread cream cheese and pecan mixture over the bottom layer of the cake. 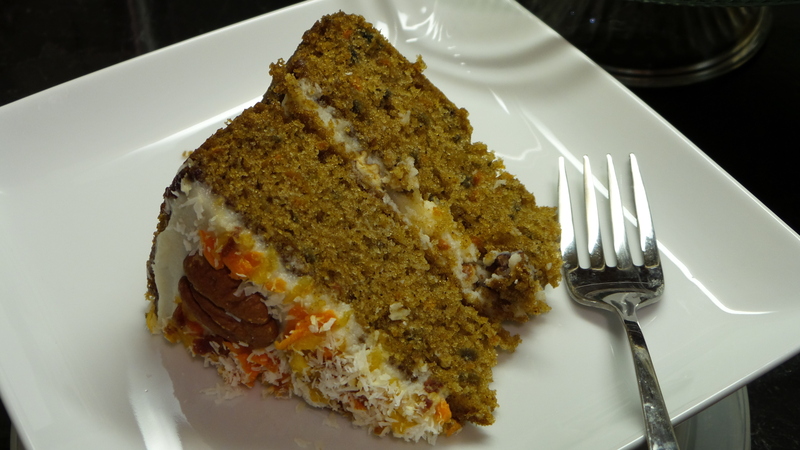 Place the top layer of the carrot cake over the cream cheese frosting. Spread the other half of the frosting on the top layer of the cake. Arrange the pecan halves on the frosting. 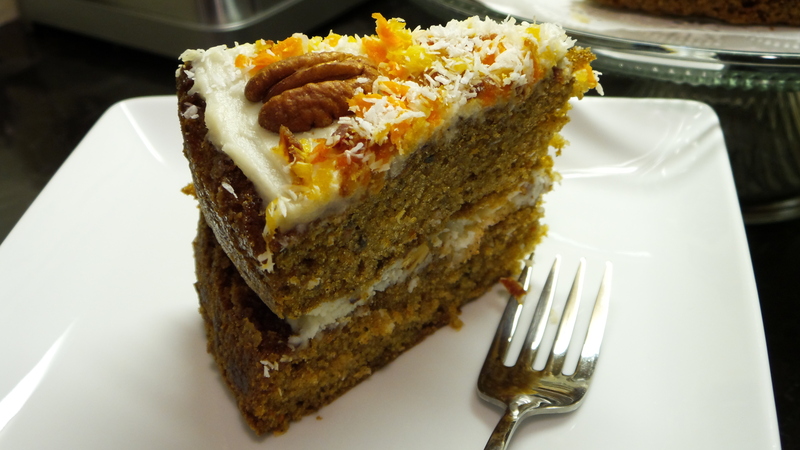 Sprinkle the grated carrots and desiccated coconut flakes over the frosting.